The 12th London Legal Walk, which took place on Monday 16 May, was organised by the London Legal Support Trust, an independent charity, supports free legal advice services in London and the South East. The London South Bank University (LSBU) team was joined by lawyers, advice workers, supporters and senior figures in the legal profession, including the Lord Chief Justice, the Master of the Rolls, the President of the Supreme Court, the Attorney General, the Director of Public Prosecutions, and the President of the Law Society. Alan Russell, Senior Law Lecturer and supervisor in the Legal Advice Clinic (LAC), said: “A big thank you to all of our walkers and everyone who sponsored us. “The walk could not have come at a better time for cash-strapped legal advice agencies and their clients. Savage cuts to legal aid mean that, since 2013, people can no longer get employment, welfare benefits, debt and education advice under Legal Aid, whilst access to free advice in housing, family and immigration cases has also been severely restricted. 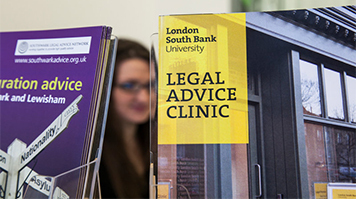 The LAC, which has helped more than 2500 clients since opening in September 2011, provides a free face-to-face community legal advice service, staffed by trained law students and supervised by experienced, practising social welfare law lawyers. Earlier this year the LAC, its satellite Helpdesk at Lambeth County Court and the Law Division’s Street Law project were highly commended in the LawWorks & Attorney General’s Student Awards 2016. If you’d like to support the LAC’s work, please go to their fundraising page.